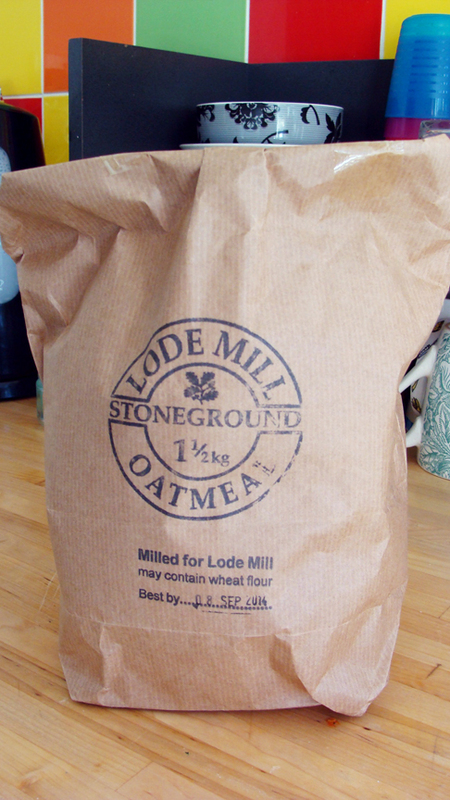 When I returned from my bike trip with oatmeal from the Lode Mill in tow, I was eager to celebrate my accomplishment and reclaim some of the calories I burned during the day (which I cannot really afford to lose). Obviously the best way to meet both these goals was to make some kind of delicious baked good with my new oatmeal. I decided to make something that would be suitable for eating at any time as part of a meal as well as a dessert: scones. For the flour, most people would probably prefer to use all-purpose, but I used bread flour since that’s what I keep on hand. As for the oats, I imagine rolled, steel cut, or any other type of oats are probably interchangeable here. After all, my oats were ground between two one-tonne stones. I used about a half cup of raisins, but I know they can be a divisive ingredient, so use whatever amount makes you happy. Be aware that if you omit them, you may want to replace them without something else to get the right balance of wet and dry ingredients and sweetness. As a last note on ingredients, I recognize that most people will not have whey on hand. I used whey as a replacement for buttermilk. Buttermilk contributes milk fat and protein to a recipe, but more importantly it contributes acid. Since I would already get plenty of milk fats from the butter, I opted for protein-rich, acidic whey. Making the scones is very easy. Simply mix together all the dry ingredients, cut up the butter into small bits, knead it into the dry ingredients, add the wet ingredients, and mix it together into a dough. Then flatten the dough into two disks about a half-inch thick each and cut them into wedges as large as you’d like your individual scones to be. Bake the scones at 375 F (give or take 25 degrees – I’ve read higher and lower) for about 25 minutes. Just make sure to look that the scones have become golden brown and look like they’re done – maybe break off a small piece and try it. My scones came out delicious, and their cinnamon aroma has been beckoning to me every 10 or 15 minutes any time I work in the kitchen. They are lightly sweet, and to my taste the amount of sugar is spot on. However, they are very rich, and I would definitely reduce the butter next time I bake them, perhaps down to a third or even a quarter cup. There’s a balancing act between keeping the scone from becoming too rich from the butter and risking it becoming dry and crumbly. Since so many scones suffer from being about as palatable as hard tack, I erred on the side of having too much butter, and I was rewarded with moist, tender scones that still develop a pleasantly crisp outer crumb that has held up for days. It’s actually a bit like I made two giant oatmeal raisin cookies. Again, if you try making these I would encourage you to make your own judgment based on your tastes. This entry was posted in recipes, travel and tagged Anglesey Abbey, flour, mill, oats, scones, whey on March 11, 2014 by Dylan Bargteil.